In 2014, after a five-year noncompete agreement with his former employer expired, Ben Anderson formed Encore Welding Supply with the help and support of family and friends. At the beginning, Anderson assembled 17 people to start his welding, industrial and safety supply company from scratch. "It&apos;s not built for sale, it&apos;s built for longevity. It&apos;s kind of our last run after the 30 years I&apos;ve been doing this. So it&apos;s going to be the home stretch, hence the name Encore," Anderson said. The family owned and operated business advocates relationships and customer service first and foremost, according to Anderson. Paul Anderson, who is Ben&apos;s cousin and also vice president and general manager of the company, said the two families have been linked in business since his father purchased a company in 1974 and brought Ben&apos;s father on as his partner. He explained that the company built on family and friendship ties carries that bond over to customers, who are considered his friends. "I think the main thing we have over the competition is we understand the customer&apos;s need," Paul said. "We understand what it takes to get the job done — service above and beyond what a normal large corporation would offer." Encore&apos;s original facility is located at 2675 Temple Ave. in Signal Hill and operates as a warehouse as well as office space. Part of the business consists of the sale of cylinders of various gases used for welding. Initially, a major corporation filled these cylinders; however, demand quickly outgrew that business model. 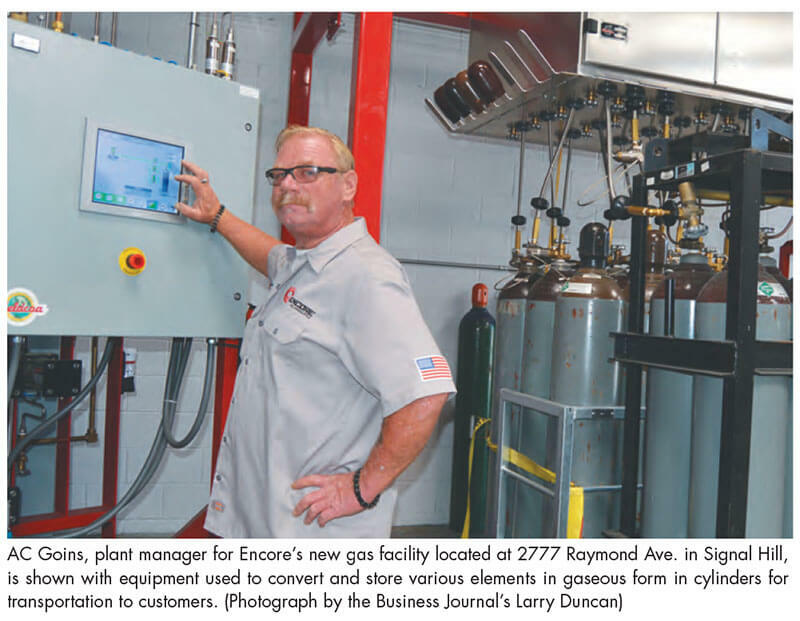 High demand for welding gases lead Encore to its first major expansion in the form of the purchase of a lot less than a mile away at 2777 Raymond Ave. 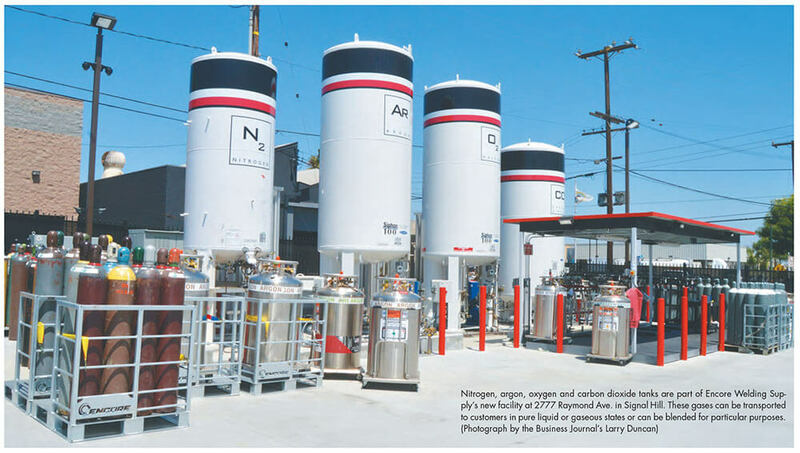 The build-out for the company&apos;s first gas filling plant cost the company just under $2 million and was completed in only six months, with the first canisters being filled in April. "Our demand grew fast enough that it became a bottleneck for us. We had to buy more and more assets just for them to stay ahead of filling our stuff," Ben said. "It just became evident that we had to do this or put the brakes on and go into a holding pattern until we could do this." The new facility sits on a 29,000-square-foot lot and includes a nearly 3,000-square-foot building, which includes off ices, canister filling stations and a laboratory for testing gases. Ben said he found the location for sale by the owner almost immediately after the company decided it was time to expand. According to A.C. Goins, the plant manager and longtime friend of the Andersons, the location serves as a five-gas pumping facility, working with helium, argon, nitrogen, oxygen and carbon dioxide. Additionally, the facility carries two types of flammable gases, including propane and chemtane, which Goins describes as propane with an octane boost. The yard is segmented it into four basic sections: flammables in one corner, liquids and carbon dioxide in another corner, oxygen on the dock, and inert and lab stuff inside. "That allows us as we grow and get more and more people working in here, for people to have areas where everything they need is in that area and they aren&apos;t crossing paths with everybody else," Goins explained. "It just makes it more efficient for flow." Bulk gas suppliers bring gases to the Encore facility, filling its tanks with the gases in their cryogenic forms. When it comes time to redistribute the gases to customers in smaller canisters and cylinders, the company can do so in liquid or gaseous states, depending on the need, Goins explained. To revert the fluids to a gaseous state, they are run through high- pressure cryogenic pumps at 3,000 psi (pounds per square inch) and sent through vaporizers. Goins said the fluids enter around 265-degrees F and come out in gaseous form 10-degrees F below the ambient temperature. Gases can be repackaged in their pure form or combined into blends for specific purposes. Goins explained that the welding industry has about 60 basic gas blends that are used, but Encore produces about 25 for its service area. The new facility will serve as a piece of necessary infrastructure for Encore to begin expanding to more locations throughout Southern California, according to Ben. He explained that the facility can provide a gas supply for up to six or seven facilities in Los Angeles, Orange and Riverside counties. Ben said the he would also like to expand to the Bay Area and Salt Lake City, among other places, which would require additional filling plants. Goins said that once demand exceeds the capabilities of the filling facility, the company plans to construct a similar facility on a larger scale and convert the current space to a specialty gas lab that does high-rate gas but at lower volumes. "We just made a significant investment in the laboratory equipment to package the gases," Paul said when discussing the future of the industry. "The laboratory grade, ultra-high purity mixtures, being able to test — that&apos;s critical, being able to test and provide certifications." Goins explained that the United States Food and Drug Administration is working on stricter rules and regulations concerning human-ingested gases, such as those used with food, beverages (including carbon dioxide used in sodas) and the medical field. He said within the next year or two these gases will be traceable back to the source to hold all companies responsible for handling them, accountable for product quality and safety. As a way of giving back to the industry and surrounding communities, Ben and Paul are members of the American Welding Society&apos;s Long Beach section. 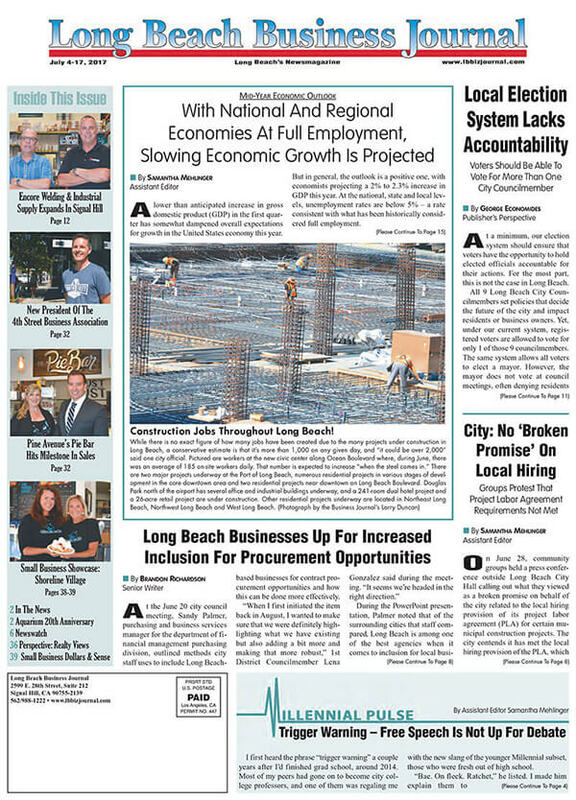 Ben explained that Encore partners with union and nonunion companies, technical schools and colleges, such as Long Beach City College, to help promote careers in welding as a "highly valuable commodity." Whatever the future brings for the welding and gas industries, Ben said he and his employees will continue to offer the best product and service possible. "We&apos;re literally getting back to the way things were back in the &apos;80s when there weren&apos;t these publicly traded giants that would gobble up all the good independents and turn everything into the big-box shopping mentality," Ben said. "We were fortunate to be able put this together and run it like we were raised how to run it. The industry has a big need for that. They just don&apos;t realize it because the mediocre service has become the norm."